The Labor Department said nonfarm payrolls rose by 201,000 in August, beating the average estimate of 189,000 of economists in a FactSet survey. The report also showed a surprisingly large 2.9% jump in average hourly wages over the past year, the most since 2009. The U.S. added more jobs than expected in August and produced a surprisingly large jump in wages, bolstering President Donald Trump's claim that his tax-cut-fueled economy is booming. Nonfarm payrolls rose by 201,000 during the month, the Labor Department's Bureau of Labor Statistics said Friday, Sept. 7. That figure exceeded the average estimate of 189,000 in a FactSet survey of economists. The report also reflected an acceleration from the 157,000 jobs added in July. 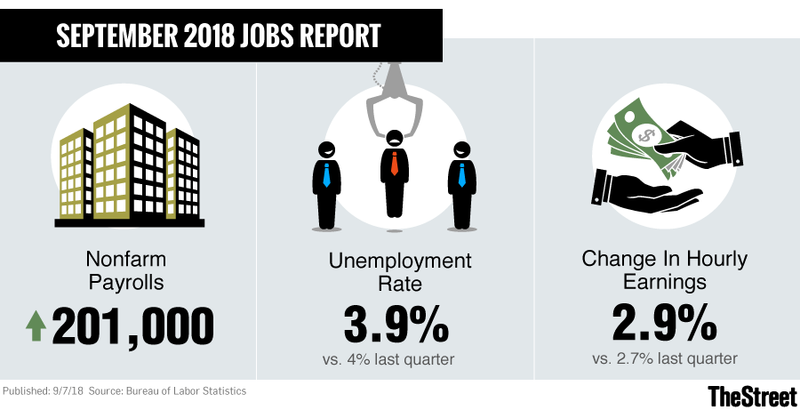 "Job gains occurred in professional and business services, health care, wholesale trade, transportation and warehousing and mining," according to the statement. The unemployment rate was unchanged at 3.9%, close to an 18-year low. Average hourly earnings for all employees on private nonfarm payrolls rose by 10 cents to $27.16, for a gain of 2.9% over the past year, the fastest in nine years. In July, the increase was 2.7%. The jump in wages is notable partly because it signals that workers are finally breaking even with inflation; the Labor Department's Consumer Price Index climbed at a rate of 2.9% in the most-recent report, for July, signaling that employees had been falling behind relative to the cost of living. "The economy's not slowing down," said Steve Blitz, chief U.S. economist for the forecasting firm TS Lombard. "It certainly keeps consumption strong in the third quarter and into the fourth." The report is likely to buttress the Federal Reserve's case for increasing interest rates by a quarter point later this month, and possibly again in December, to prevent a surge in inflation. And that could be negative for investors, says Peter Cramer, senior portfolio manager at the $17 billion fixed-income money manager Prime Advisors. "It's good for the broader economy, but for the market, this does give the Fed a bit more ammunition in terms of being able to hike," Cramer said in a phone interview. The Standard & Poor's 500 Index of large U.S. stocks rose 0.1% on Friday to 2.881, while the Nasdaq Composite Index rose 0.4% to 7,952. The yield on the 10-year Treasury note rose 0.058 percentage point to 2.935%.